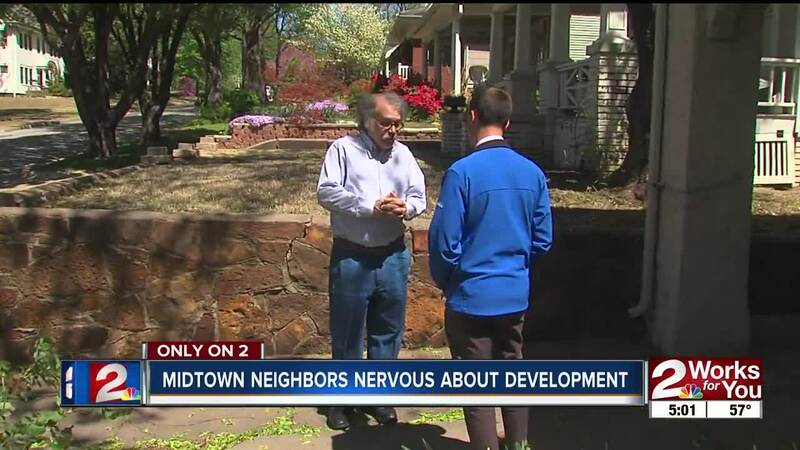 TULSA, OK (KJRH) — A proposed project in a midtown Tulsa neighborhood is causing concern for those who live there. It's a duplex proposed in the Renaissance neighborhood, and neighbors are worried it's a sign of the times - much like the big growth that's happening in areas like Brookside. The duplex is proposed to be built on an open plot off 13th and Delaware Ave. Tina Crawford has lived across the street for 26 years, and she is worried it's part of a growing trend in midtown. "If we can't win the fact that we don't want duplexes, then we'd like to sit and talk about keeping the character of the neighborhood," Crawford said. Real estate agents say they love to sell in the area, because south Tulsa residents are moving in for houses with newer, bigger designs. Neighborhoods like Brookside have a lot of older homes, but neighbors say the layout is beginning to change. "We want to keep in the same character as the area," Crawford said, "these are all different looking homes, but they were all built in the 20s." Tim Clark is president of the Brookside Business Association. He says the area, which has homes up to decades old, is beginning to evolve. "I don't know if people have gotten tired of pushing back, or if they're just becoming accustomed to the change," Clark said. "It's bittersweet, because the progress of Brookside brings more people, which also brings change." As for the plans for the Renaissance neighborhood, the developer said in a Tulsa Board of Adjustment meeting he wants to work with neighbors on a design for the proposed duplex. Neighbors will speak in front of the board about the project in two weeks.